The TennisTour has set up a Facebook connect application to allow you to connect your facebook account with your TennisTour account. Use your facebook profile picture as your TennisTour profile. Your picture will be linked to your Facebook profile page. 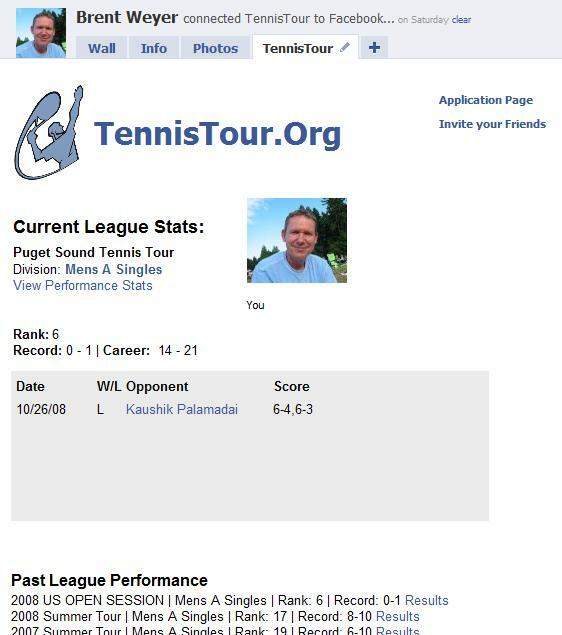 Players are taken to your Facebook profile from your TennisTour profile page. Facebook Tab: Track your stats, latest matches, match requests, and yoru five list from your Facebook profile tab. The intent is to provide TennisTour content to your facebook profiles and to expand the TennisTour network of players. What TennisTour sees from Facebook after you connect Facebook? TennisTour only sees information that would be available to non-registered facebook users based on your security settings. If one of your Facebook friends sees your Tour profile he/she could go to your Facebook from your TennisTour profile and see your profile. What information from Facebook is stored on TennisTour? The only information stored on TennisTour from Facebook is your Facebook userid. We use this userid to dynamically load content from facebook. What information from TennisTour is shared with Facebook? TennisTour does not share your data with third parties. Facebook does not have access to your TennisTour profile data. TennisTour is working on posting content to Facebook such as match results and maybe match requests. Such content posting will first be authorized by the poster and will not include personal contact information. First, you need a TennisTour account. After you set up your TennisTour account and logon you can select FBConnect to connect your facebook account to TennisTour. You will then see a secure Facebook authorization window for you to enter your Facebook logon info. That's it. Is it required to have a Facebook account? No, you do not need a Facebook account to use TennisTour. Linking your Facebook account is encouraged to provide a complete social networking experience.